Kalk Bay is a fishing village on the coast of False Bay, South Africa and is now a suburb of greater Cape Town. 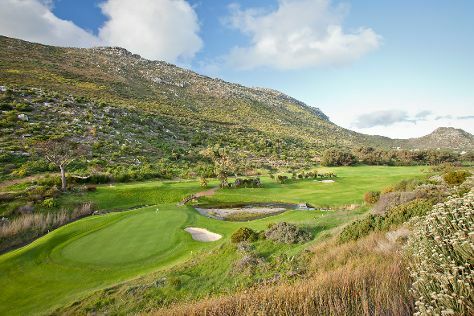 It lies between the ocean and sharply rising mountainous heights that are buttressed by crags of grey Table Mountain Sandstone. A literal translation from the Dutch/Afrikaans name "Kalkbaai" is "Lime Bay". This derives from the vast deposits of mussel shells found there, which early settlers burned to make lime for construction. Lime kilns to roast mussel shells are still found along the west coast. The railway from the central business district of Cape Town to Simon's Town passes through Kalk Bay and in some places the line is only metres from the water's edge.The Foundation Stone for the harbour was laid in 1913.Several famous caves are located in the mountains above the village. They are of importance to spaeleologists because they have formed in sandstone. Large cave systems are not often found in this type of chemically unreactive rock.Kalk Bay is also home to the tiny but locally famous surf spot named "Kalk Bay Reef". This is renowned for heavy barrels and the associated shallow reef. It is best surfed on a big south-easterly swell or a north west wind. In smaller swells low tide makes for better barrels. Southern right whales come here during whale watching seasons, and are often seen playing or resting very close to surfers or piers. Kalk Bay is in Cape Town. Make your own Kalk Bay vacation itinerary, with a little help from those that know the place like the back of their hands, by using our South Africa trip planner.